Took the opportunity to get out of PJs and take baby for a check up at our local child health clinic. We have been visiting a lot as it's nice to have a reason to get up and get out of the house with baby, rather than just walking Cooper! Baby T is thriving, our frequent visits are just taking advantage of all the support we have available. For those not in Australia, at the clinic you can book appointments to have regular and ad-hoc chats with the nurses, attend sessions about various baby and child related things (like advice on settling baby to sleep! ), and just go to weigh baby and make sure everything is progressing well. It's a fantastic service! I'm very grateful to have access to so much help and support as a new mother. First time I've worn this recently purchased scarf, it's so pretty. I paired it with the grey dress (also on its first wear) as I thought the pastel colours paired worked well. Couldn't resist adding just a little more colour with the cobalt blue of this leather jacket though. It's a good piece for the Style and Shenanigans texture challenge: leather. It's almost Spring, and I've only worn this jacket twice this Winter. I paid full price for it, and it's the most expensive clothing item I own - even have some handbags that are cheaper! It has been worn so little this year as I'm a little worried about holding a newborn baby around it. I'm trying to wear the jacket on days I don't have to be out long and shouldn't need to feed baby T, to avoid any accidents. When I was a little girl, I left my mark on a family friend's leather jacket, and even after dry cleaning it was never the same....wouldn't want that to happen to this! Hopefully will get more wear next year. Last worn: blue leather jacket, Asos ankle boots, Marc by Marc Jacobs baby bag. First time I've worn the scarf and dress as they are recent purchases. Loved wearing this scarf so much I wore it again the very next day! Just a nice casual outfit to go to the post office and run some errands with baby T. Paired the pastels with blue again, and some purple with the tee. It was such a warm day, I ended up taking the denim jacket off as we walked home in the sunshine. The scarf kept me cosy enough. It's certainly much bigger than I expected, a nice blanket size scarf. I didn't check the measurements before I bought it. It's warm and I like the print and colours. I'm just concerned it might be a little too big on me, what do you think? Need to think of more creative ways to tie and wear it in future. Might not get worn as much as I thought it would as the weather warms, but it was a bargain at under $10 (on sale with an extra % off) so I should still get my money's worth from the purchase. 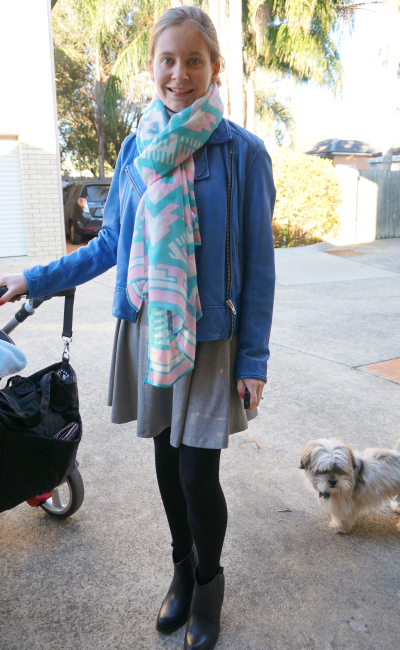 Last worn: pastel printed scarf (see above), denim jacket, purple tee, black maxi skirt, Converse, MbMJ baby bag (see above). Linking up with Let It Shine, Style To Inspire, Mix it Mondays, DC in Style, Manic Monday, SNS Style Challenge, Style Sessions, Confident Twosday, Trend Sin Linkup today. That's a lovely scarf! Beautiful pattern and color combination. Love the colors in your scarf! The clinic visits sound like such an amazing service! I would imagine it is really helpful to have access to others for that type of support. Sounds like you all are doing well! Yes, we are very lucky to have so much support! I love both ways that you styled that scarf! So pretty! I love your fun scarf. It will be a good one to wear all season long. I am majorly crushing over your blue leather jacket! I love the color and cut! It's perfect! While it is a *little* bit big, I think the scarf is fun. I'm a big scarf person, and I am getting tired of seeing the same size infinity scarf in the stores! I do love them, but this is different and eye-catching and I like it! Love the pattern and the colour of the scarf. I LOVE scarf for winter. It is the easiest way to dress up any outfit not to mention keeping you warm. big blanket scarves are my favorite. i think it's fine if you look a little bit bundled up, it is winter after all! the new mom services in australia sound amazing. glad you and baby T are being well taken care of! Very true, it does keep me cosy! I like the way you styled it in the first photo Mica! It's a fabulous print and looks gorgeous on you. You have some wonderful services available to you! Glad baby is well! I hate it when you have something that is almost too beautiful to wear! What is worse - leaving it pristine in the closet and never enjoying it, or wearing it and risking getting it dirty? I do need to ask myself that more often! Much rather just set the jacket aside for now while baby is so small and messy, I'm sure to get lots of wear from it next year! I think the scarf looks great! I think the big blanket scarf trend is fun! This scarf is indeed beautiful..love the color and the print so much!! That cobalt blue jacket is gorgeous on the first outfit.. So very pretty!! It's a great scarf and it looks like you are putting it to great use. If it's a really big scarf, you could tie it and wear it as a vest too. Thank you for your lovely comment. I really like your scarf on this look. Hope to see some more next week. The scarf is truly pretty! Pastels are still one of my favourites during summer. Haha yes I just need to be very careful when I wear it near baby! I love the colours and how big that scarf is ! and yes, sometimes I feel guilty about wearing items that are almost "too beautiful" to just wear to an errand. I am glad to hear that the medical services there work. You don't want to get me started with all the terribleness in our system. I love this scarf! The colors are so pretty! That leather jacket is a classic piece you will be able to wear for years so don't worry that much that you haven't worn it this year. That's a beautiful scarf and adds a lovely touch of color to both outfits! How nice you have all those baby health services available! Great casual outfit for a doctor's appointment! The scarf is a nice touch, very pretty! Love the scarf!!! the colours are stunning and will work for spring too!